The history of hatcheries in Oughterard goes back to 1852 when the first commercial salmon hatchery in the world was established there. In 1852 brothers Edmund and Thomas Ashworth, Lancashire Quakers and members of a famous cotton manufacturing family, bought the Galway Fishery which was then in a rather parlous state. Catches were low and poaching rather than legitimate capture was the dominant method of fishing. The brothers were members of a group of wealthy gentlemen for whom angling was a favoured recreation. They immediately brought the enterprising spirit which characterised their business operations to bear on their new purchase. They determined to improve the Corrib fishery by artificial propagation and restocking. This had never been tried before with migratory salmon and the Ashworths were true innovators in this endeavour. For the actual operations they called on their fishing tackle maker, one Robert Ramsbottom of Clitheroe, Lancashire. Since the original of that engraving was sent by Thomas to Frank Buckland as an illustration of the Oughterard operation it is probably a fair representation of how things actually looked. 24,000 salmon eggs were laid down in 1852 from which 20,000 hatched – not at all a bad outcome! 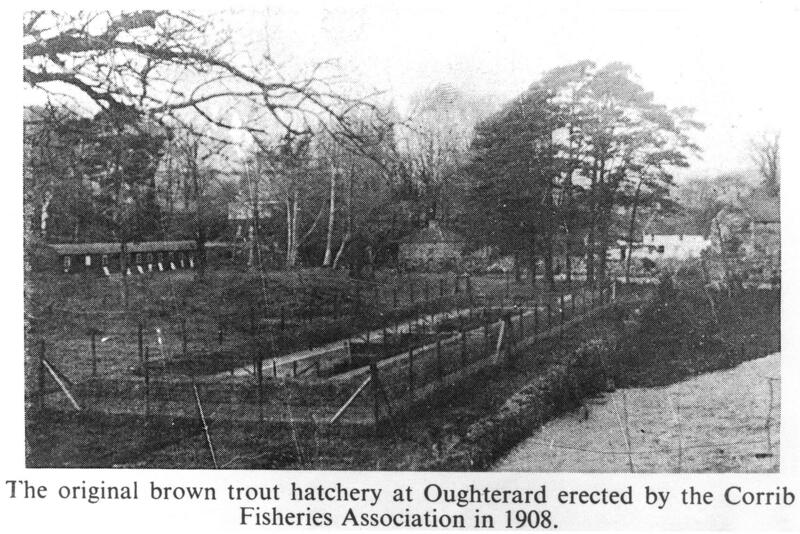 The first Oughterard hatchery, simple though it was, was up and running and its success would soon inspire others throughout the world to commence what we now know as salmonid aquaculture. The enterprising Ashworths knew the value of good PR: the year that the first alevins hatched – spring of 1853 – was the year of the Great Industrial Exhibition in Dublin and later in the year some of the artificially produced parr were consigned live to the great event. By happy coincidence, if not by design, the Commissioners of Public Works were exhibiting a model of the fish ladder which they had installed in the Galway Regulating Weir in 1851. It was a working model, as one would expect from practical Victorians, and it had a good supply of flowing water. When Ashworth’s fish were placed in it they soon ascended the ladder to the delight and amazement of all. Here were two of the most significant advances in fishery management in the 19th century being exhibited to the general public for the first time ever and both were from Galway! The whole thing was such a hit with everyone that the fish and model were invited to the Great Paris exhibition the following year, where they greatly impressed the Emperor and his retinue. In1854 Ramsbottom published an account of his Oughterard labours as a small booklet. This is now exceptionally rare and I am happy to have a copy in my possession. The title page is shown figure 2, and what a lovely 8month old parr it shows. Note, too, the way the town’s name is spelt. Incidentally, Ramsbottom designed a fly for Connemara sea-trout called “Ramsbottom’s Favourite”. I wonder how many readers can still tie this? Salmon hatching soon moved from Oughterard to other locations in Galway. Since there were no buildings, there are no physical remains of the original hatchery. 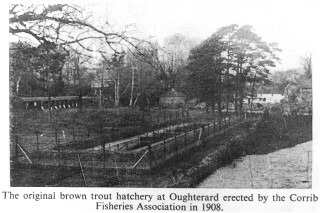 The second hatchery at Oughterard was a trout heathery which opened in 1900, but by that time there was little memory of the first great venture. Although it has left no physical remains, it left a legacy of salmon cultivation around the world. Noel P. Wilkins, The story of the Oughterad hatchery and other hatcheries and salmon fisheries of Ireland one hundred years ago is given in detail in the author’s book “Ponds, passes and parcs”. Although now out of print, copies may be obtained through Kenny’s bookshop, Galway. P.S. Background information which may be of interest. The discovery that the eggs of salmon could be artificially propagated has been generally attributed to the 14th century monk, Dom Pinchon. Following pioneer work by Jacobi in Germany (1763-64); Shaw, Scotland, (1833-39); and Remy & Gehin, France, (1842-45) the first authoritative paper on hatchery management was published by Ashworth E. and Ashworth T. Oughterard, Ireland (1853) “A Treatise on the Propagation of Salmon and other Fish”. The earliest authoritative work on hatchery management advanced artificial propagation from the production of salmon ova to the smolt (stage at which juvenile salmon migrate to sea). One copy of this rare historically significant document is diligently cared for in the National Library. Inquiries to international libraries such as the British Library have failed to locate further copies to date. Note: The opening of communication with Lough Mask, by which salmon can ascend to its many valuable spawning tributaries, must produce valuable results. The Chapter Fishery at Galway has been purchased by Messrs Ashworth, of Stockport who have commenced protection vigorously, and have had a person employed for the last winter in the artificial management of the ova, the results of which are watched with great interest. The Ballinrobe Chronicle of March 21st 1891 carried a report in relation to the setting up of a Limited Company for the purpose of acquiring the fishing rights of lakes and rivers in Connemara and elsewhere in the West of Ireland to take steps for improvement of the fishing lakes and rivers where considered necessary and to secure for its members and others special advantages and conveniences. The Company was being set up by Mr Robert Jasper Martin of Ross House and Mr. Henry Hodgson of Currarevagh. Unnamed members in the Company included one from Belfast, one from Leeds and two from London. The Solicitors were to be Blake and Kenny, Galway and the bankers, Provincial Bank, Galway. It was Company’s intention to stock Lough Corrib with white trout. Does anyone know if this Company came into existence?